Altus Director 2.2 and higher supports the use of Amazon Elastic Block Store (EBS) volumes with Cloudera Manager and CDH cluster instances. You can use EBS volumes to store HDFS data, stage data for processing, or install other applications. EBS can provide an efficient and cost-effective alternative to S3 or other storage mechanisms. EBS volumes for a Cloudera Manager or CDH cluster instance have the same lifecycle as the instance. EBS volumes are terminated when the instance is terminated. Repair of an instance does not result in the remounting of an existing EBS volume; a new volume is used. An advantage of using EBS volumes for cluster storage is that it allows you to pause your cluster and stop the associated EC2 instances during periods of inactivity. You will still be billed for your EBS volumes while the cluster is paused, but will not be billed for the stopped EC2 instances. For information on pausing a cluster, see Pausing a Cluster on AWS. Note: If auto-repair is enabled on a cluster that uses EBS, you must disable auto-repair for the cluster before stopping either the cluster or the Cloudera Manager instance that manages it. For more information about auto-repair, see Auto-Repair for Failed or Terminated Instances. gp2 1 GiB - 16 TiB General-purpose SSD (solid state drive) volume that balances price and performance for a wide variety of transactional workloads. io1 4 GiB - 16 TiB Provisioned IOPS SSD (solid state drive) volume. Highest-performance SSD volume for mission-critical low-latency or high-throughput workloads. Note: When configuring io1 volumes in an instance template, specify the IOPS value (the number of I/O operations per second to provision for the volume). st1 500 GiB - 16 TiB Low-cost HDD (hard disk drive) volume designed for frequently accessed, throughput-intensive workloads. sc1 500 GiB - 16 TiB Lowest-cost HDD (hard disk drive) volume designed for less frequently accessed workloads. For more information, see Amazon EBS Volume Types. Instance stores, like EBS, provide block storage for EC2 instances, but they cannot be used together with EBS volumes. Instance store volumes are located on disks that are physically attached to the host computer, and they are optionally included with many EC2 instance types. Important: Altus Director does not support using instance store volumes together with EBS volumes for the same EC2 instance. All block storage volumes in an instance should be the same size, capacity, and type. If an instance type has instance store volumes and you do not specify EBS volumes, Altus Director automatically mounts all the instance store volumes that are available. If you do specify EBS volumes, Altus Director does not mount instance store volumes. For more information on EC2 instance stores, see Amazon EC2 Instance Stores in the AWS documentation. You configure EBS volumes in the instance template in the web UI or in the instance section of the configuration file for clusters launched with the CLI and bootstrap-remote. To configure EBS volumes in the web UI, provide the required values in the Advanced Options section of the instance template. Note: The configuration settings below do not apply to the root volume, but only to additional EBS volumes. Configuration settings for root volumes depend on the AMIs you have chosen for the instances. EBS Optimized: Specify whether to enable EBS Optimized I/O. This optimization isn't available with all instance types. Some instance types are EBS optimized by default regardless of this flag. Additional usage charges may apply when using an EBS-optimized instance. EBS Volume Count: The number of EBS volumes to mount. Altus Director will create and attach these volumes to the provisioned instance. These added volumes will be deleted when the instance is terminated from Altus Director. EBS Volume Size (GiB): The size of the additional EBS volumes to mount. Specifying a size outside the ranges defined in the table above causes cluster deployment to fail. EBS Volume Type: The EBS volume type for the additional EBS volumes. Supported volumes are Throughput Optimized HDD (st1), Cold HDD (dc1), General Purpose SSD (gp2), and Provisioned IOPS SSD (io1). All EBS volumes for an instance must be of the same type. EBS IOPS Count: The number of I/O operations per second (IOPS) to provision for the volume. Only valid and required for Provisioned IOPS (io1) SSD volumes. Enable EBS Encryption: Whether to enable encryption for the additional EBS volumes. Note that the encryption does not apply to the root volume. EBS Key ID: The full ARN of the KMS Custom Master Key (CMK) to use when encrypting volumes. If encryption is enabled and this is blank, the default CMK will be used. Note that encryption does not apply to the root volume. # properties don't apply to the root volume. # for EBS will be used. The encryption here does not apply to the root volume. enableEbsEncryption: Labeled Enable EBS Encryption in the web UI. Set to true or false. If this value is set to true, the data on EBS volumes created with this instance template will be encrypted. Important: If you specify a custom master key for EBS, you must also add the KMS policy DescribeKey to your IAM policy file so that Altus Director can validate the custom master key. For more information and a sample IAM policy file that includes DescribeKey, see Creating AWS Identity and Access Management (IAM) Policies. 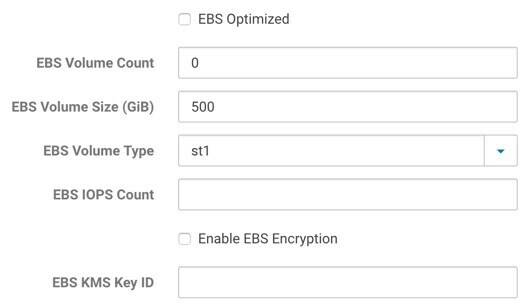 For more information about EBS encryption, see Amazon EBS Encryption in the AWS documentation. For more information about KMS, see AWS Key Management Service Details in the AWS documentation. AWS does not support creating an encrypted root volume as part of the process of spinning up an EC2 instance. To create an encrypted root volume, begin with an AMI that already has an encrypted root volume. Instances launched from such an AMI will also have encrypted root volumes. The AWS account that Altus Director uses must have the necessary permissions to use an AMI with an encrypted root volume. Note: If you use an AMI with an unencrypted root volume, and configure Altus Director to encrypt the additional EBS volumes, Altus Director will not also encrypt the root volume. If the AMI does have an encrypted root volume, it will still be encrypted for the new instance. When requesting EC2 instances in Altus Director with additional EBS volumes or requesting an instance that contains instance store volumes, Altus Director will automatically assign device names to the volumes. For more information about device names in EC2, see Device Naming on Linux Instances in the AWS documentation. You can configure the way the device names are assigned to the volumes. This might be necessary to ensure that the device names used by Altus Director doesn't overlap with any additional volumes associated with an AMI. By default, AWS creates instance store volumes with device names /dev/sdb, /dev/sdc, /dev/sdd, and so on. You can configure the device name prefix and starting character by adding the following section in etc/aws-plugin.conf under the AWS plugin directory. By default, AWS creates EBS volumes with device names /dev/sdf, /dev/sdg, /dev/sdh, and so on. The device name prefix and starting character can be configured by adding the following section in etc/aws-plugin.conf under the AWS plugin directory. Note that Altus Director does not attach both instance store volumes and EBS volumes at the same time. If you specify EBS volumes, instance store volumes will not be attached.